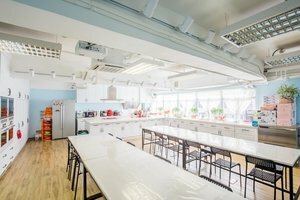 Nestled in the lively and vibrant area of Cheung Sha Wan, this 1,500 square feet pop-up space is available to rent for cooking classes and private dinners. 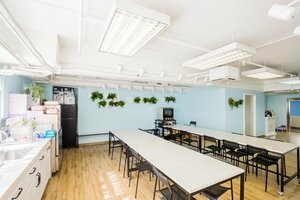 The space is located on the 11th floor of an industrial building. 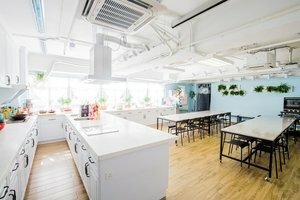 This might sound a bit out of reach, but in fact, this space is just a few steps from the MTR station; Moreover, industrial buildings have been renovated in recent years, this space is still easily accessible. This charming space consists of a large room, a kitchen, and a toilet. It is also well equipped with sufficient kitchen wares, audio system as well as Wifi connection. The space is like a fairy tale coming true, with a fresh white colour scheme, decorated with walls in tiffany blue and potted plants.